Summary of questionnaire results. “Strong interest” will be defined as an average response of 4.5 or above. “Low interest” will be characterized by an average response of less than 4.0. 3: All but the artists felt a strong need for a new performance and rehearsal space, though the artists saw some need. Dancers and choreographers saw the greatest need, giving nearly perfect scores to this question. 4: Dancers gave the only perfect score of 5 from any group for any question on this one, the interest in the space being historic. This implies they draw something from their surroundings when performing that isn’t appreciated by the other groups. The other groups were typically less interested, the choreographers barely showing strong interest with 4.56 and the artists low interest at 3.75. 5: Choreographers and artists, however, were both strongly interested in viewing onsite artwork, whereas the dancers and academics were less so and the administrators the lowest. The story here is that combination of onsite art with a historic space would engage a wider creative audience; all but the administrators were highly enthused by the question 4 & 5 combo. 6: Choreographers found high interest in research at this facility, with some interest from artists, dancers, and academics. The academics are perhaps less interested than choreographers because more archives and facilities are known and available to them. 7: Dancers and artists were strongly interested in a new system of documentation. 8: Choreographers, dancers, and artists all strongly valued collaboration and interaction with each other. 9: All groups felt the audience did not appreciate the collaboration among various artistic groups. Administrators were the most skeptical. Choreographers, interestingly, were the most idealistic about the audience’s appreciation of their collaborative efforts. 11, 12: Public access and received some interest from all but the administrators, and no group showed strong interest. 13: Among the groups, some interest at least was shown by all but administrators for dance-related exhibits, with the artists showing strong interest. 14: Surprisingly, dancers rather than choreographers were the most interested in the creative process of choreographers. Choreographers were more interested in their own process rather than the process of other choreographers by the admission of one respondent, though they, as well as artists and academics, showed some interest. 15: Dancers were strongly interested in documentaries. 19: Except for administrators, over 70% used dance research materials. 20: Choreographers jumped from 71% to 96% who would use dance materials in research if they were more readily available, a significant increase showing the need for a facility to serve them in this regard. Administrators gave very low marks because they seemed to either have no need for such material, or already had access to it from semi-private sources. 21, 22: Most dancers and choreographers have their own notation system, and would continue to use it if they had videotaped rehearsals, mostly because many remarked that their own system, already, was indeed videotape. 23, 24: Dismal ratings were given to current formal notation systems; video was favored. 25, 26: Both dancers and choreographers strongly wanted video of their performances. Dancers had some interest in video when working alone, though the choreographers were less interested, perhaps because they are not trying to learn the moves of others. Top 2 questions of each group, by response/excitement level. Choreographers: Highest interest in a new space where onsite art and documentation were available. Dancers: Highest interest in a new space that is also a historical site. 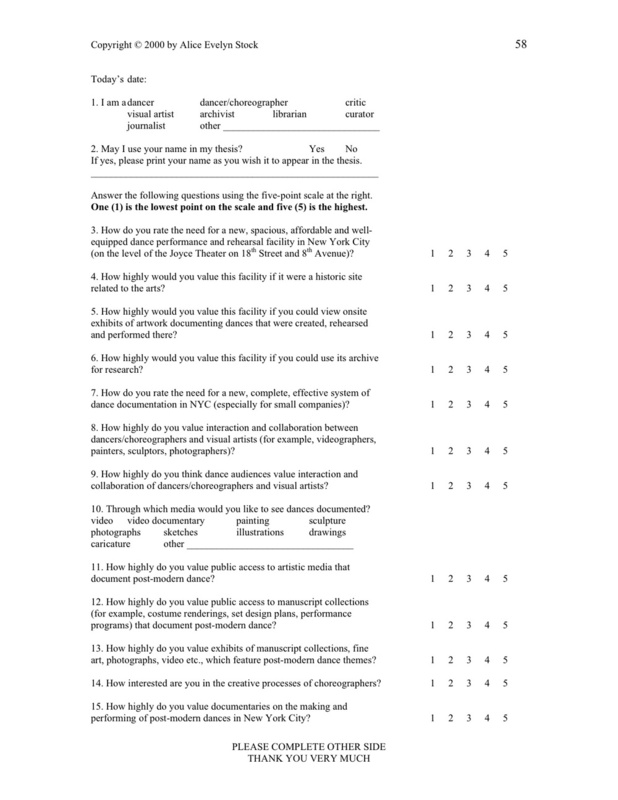 Artists: Most interested in a better way to document dance and in the collaboration between artists and dancers. Academics: Most interested in a new space and the creative process of choreographers. Administrators: Most interested in a new space that is also historic. Overall: Strong interest in a new space. Some interest in everything else. Artist: low interest in historic nature of site. Administrators: low interest in everything EXCEPT a new site that is also historic. Presumably, the artists are most interested in their work and less in the sentimental features of their work environment; indeed, it may be a distraction to their process. Administrators, on the other hand, value the historicity probably as a selling point. Dancers like the historic nature probably for inspiration. The percent response by group also tells a story. Choreographers were very highly motivated to complete the survey with 83% responding. Dancers and artists were also very interested at over 50% response rate. About a third of academics and administrators replied, which though showing lesser interest, is still a large amount. The overall response rate of nearly 50% is very high.